And already has 1MW, new facility to open this month,12MW to follow. Romania-based EvoBits, which already operates a 1MW data center for cryptocurrency mining, will open a 3.5MW facility this month, according to a presentation at Vertiv’s Innovation Summit in Zagreb earlier this week. A 12MW facility is due to follow. 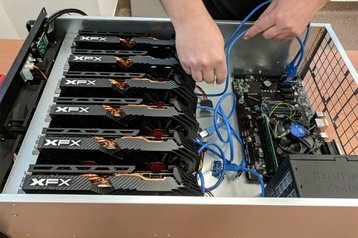 The company, which offers consulting and hosting, is deeply involved in cryptocurrency business, but advocates standard data center architecture, instead of the non-standard “minimalist” approach used by many mining operations, partly because it offers a long-term strategy beyond Bitcoin, according to CEO Catalin Balaci. The company has bought evaporative free cooling (EFC) systems from Vertiv. “[is not really a race to the bottom business,” Balaci told DCD at the Vertiv summit, where EvoBits was featured as a case study. Balaci believes that cryptocurrencies are “evolving,” and present a very good way to build a profitable data center which is operating at 100 percent capacity. His presentation compared a “professional” cryptocurrency data center with the minimalist approach, where specialist hardware is operated in non-standard racks. Running a professional setup requires more investment, but the data center still becomes profitable in three years, he said. EvoBits has six new Vertiv EFC systems, he said, which are the company’s first to be sold in Eastern Europe, following a large European sale to a cloud player believed to be Microsoft. As well as professional cooling, the site has invested in fiber connections to European data center hubs such as Frankfurt: “We have everything there. I can spend a minimum amount and I will have a data center that I can certify as Tier III or Tier II. I’m using the mining business to cover my initial investment costs. That’s why I am prepared to make an initial large investment which pays out in three years. If something happens, I have a data center and I can host pretty much anything there.